One of the most important equipment on processing plant (oil and gas and power plant) is piping. The piping consist of power piping, process piping, pipeline in many fluids (liquids or gasses). The terms of power piping and process piping generally refers to the system of pipes that transport fluids (e.g. fuels, chemicals, industrial gases, etc.) around an industrial facility involved in the manufacture of products or in the generation of power. It also is used to describe utility piping systems (e.g., air, steam, water, compressed air, fuels etc.) that are used in, or in support of the industrial process. Also, certain drainage piping, where corrosive or toxic fluids are being transported and severe conditions may be present, or where it is simply outside the scope of plumbing codes, is also sometimes classified as process piping. Some places where process piping is used are obvious, such as chemical and petrochemical plants, petroleum refineries, pharmaceutical manufacturing facilities, and pulp and paper plants. Rules has been developed considering into Power Piping found in electrical power generating stations, industrial, and institusional plants, geothermal heating systems and central heating and cooling systems. Beside that, Process Piping has been found in petroleum refineries, chemical plant, pharmaceutical, textile, paper, semoceonductor, and cryogenic plants, and related processing plants and terminals. This training is accompanied by case study in some engineering execution, so that the participants understand correctly the material and the implementation in the field. To DESCRIBE the role and structure of the Piping Sizingstaging and procedures effectives and efficient. Hilman Ahmad & Associates is an independent consultant in mining, and oil & gas industry, who manage the Education Center for Professionals. The Director himself has been practicing production operation, safety, and corrosion control engineering in Indonesia for more than twenty-five years. He post-graduated from Tokyo Institute of Technology (sponsored by UNESCO) in 1977. He joined in-field-practice program at Nippon Kokan Steel Company & Research Center Kawasaki, Japan, for production facility, design & construction, and corrosion prevention & control in 1983, and collaborated with Cormon Industrial Research Center, Brighton, UK, for integrity on-line corrosion monitoring development in 2000. He has been delivering consultative course in production operation, maintenance, safety, pipeline (onshore and offshore) and corrosion control for personnel from oil, gas, &mining company and petrochemical industry since 1979. 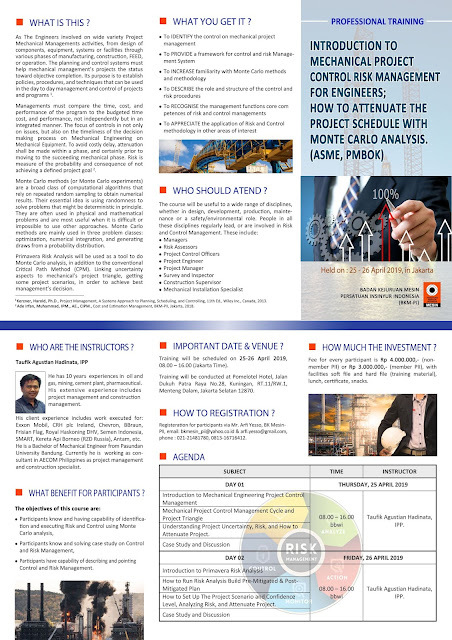 Training scheduled on 02 – 04May 2018, 08.00 – 16.00 (Jakarta Time). Training will conduct on Pomelotel Hotel, JalanDukuhPatra Raya No.28, Kuningan, RT. 11/RW.1, MentengDalam, Jakarta Selatan 12870. 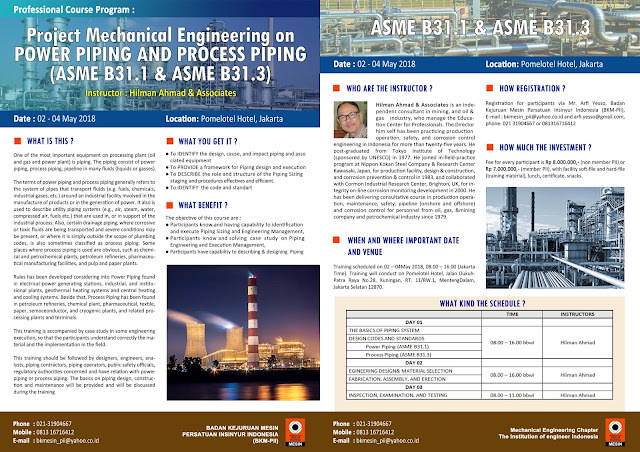 Registration for participants via Mr. ArfiYesso, Badan Kejuruan Mesin Persatuan Insinyur Indonesia (BKM-PII), email :bkmesin_pii@yahoo.co.id and arfi.yesso@gmail.com, phone : 021 31904667 or 081316716412. Fee for every participant is Rp 8.000.000,- (non member PII) or Rp 7.000.000,- (member PII), with facility soft-file and hard-file (training material), lunch, certificate, snacks. WHAT KIND THE SCHEDULE ?